The Mendocino Music Festival opened its doors—or rather, pinned back its tent flaps—on Saturday, July 10, for the 24th season of music-making on the headlands of the picturesque village of Mendocino. Housed in an enormous 16,000 square foot tent that seats 800, the festival runs nightly through July 24, alternating classical symphony with opera, jazz, bluegrass and dance. Founding artistic director Allan Pollack conducted the Festival Orchestra on its opening night in a concert of Russian masters, earning long ovations from a delighted audience. After a rousing rendition of Dmitri Shostakovich’s Festive Overture in A Major, with well-rounded and muscular brass, Stephen Prutsman soloed in Sergei Prokofiev’s Piano Concerto No. 3 in C Major. This was a high point of the night. Not only was this an elegant and powerful rendition, but watching Prutsman’s infectious enthusiasm from the intimacy of a tent as Pacific rollers broke against the beach below, made for a magic moment. Country folk tend towards a flexibility of trades, survival crafted into art, and both founder Pollack and pianist Prutsman share that. Pollack, who co-founded the Festival with his wife, pianist Susan Waterfall, is an eminent conductor, composer, and jazz saxophone player. 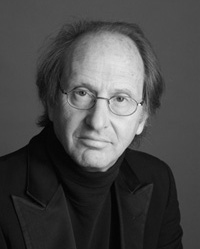 Prutsman, equally multitalented, is a renowned pianist, but has composed and arranged music for many prominent groups, including the St. Lawrence and Kronos String Quartets, Tom Waits, Joshua Redman and Yo Yo Ma, and recently became the artistic director of the Cartagena International Festival of Music. This deep and eclectic approach to the music may have inspired the performance we heard, which invoked and fused Prokofiev’s disparate facets—piano prodigy, caustic wit, soulful Russian, and brilliant composer. In particular, Prutsman conveyed Prokofiev’s absolute delight in the difficult piano passages, and with Pollack’s blessing took a demonic turn of speed. And that was a gamble: many of those passages have sizzling orchestral accompaniments. The next morning I ran into a member of the orchestra and she reported that it was the fastest they had ever played the piece. And they made other recordings sound pedestrian. They finished out the program with Tchaikovsky’s Symphony No. 5 in E Major with a warmth that only deepened the melancholy. This was big-boned music, with deep harmonies and the soft thunder of kettledrum. And Tchaikovsky’s intimacy, in the Cantabile and Valse, held as sweet a regret as any Brahms. The members of the orchestra, many of whom hail from the Bay Area, have yearly been housed with open arms by the town dwellers—and for the tiny population of 1000 to host an orchestra of 87 is no mean feat. Particularly if you add all the other singers, musicians and dancers of this two week festival! Thursday evening will find a remarkable program of American composers, conceived and narrated by Susan Waterfall. Saturday is Big Band Night with vocalist Ava Logan, and Friday and Sunday the steamy opera Carmen fills the Big Tent. The full program is at www.mendocinomusic.com and ends July 24 with Orff’s Carmina Burana, staged with the assistance of over 130 local singers. Photo top: artistic director and conductor Allan Pollack, photo by John Blaustein. 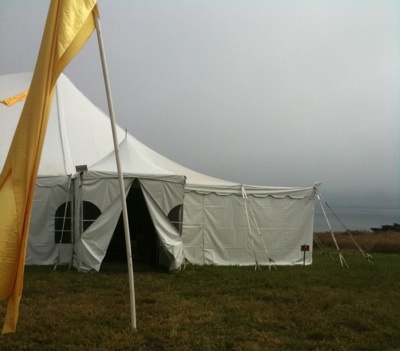 Photo bottom: Festival tent, on the Mendocino headlands, taken one hour before the opening performance, photo by A. Broner. Next Next post: Contemporary Electronics on Capp St.